Who formed the weasel words? Who voted for this ‘law’? Who signed her death warrant? Long after she’d been murdered by the state. Who’s will be the next name to be chalked up on your gory slate? 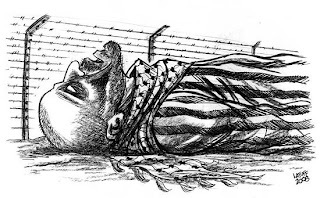 What has Latuff's cartoon got to do with the poem that follows? I am making a point here. This is the same fight and we are dealing with the same enemy. The deportation of Ama Sumani (described by Lin Homer, chief executive of the Border & Immigration Agency, as “not exceptional”) not only shows a total lack of compassion, it suggests a vindictive cruelty in the methodology of the Border & Immigration Agency. By denying her the drugs she needed & the support people were willing to give, the Border & Immigration Agency are guilty of no less than culpable homicide. It is horrific that someone receiving treatment vital to their survival can be removed from hospital against their will. What is chilling is that this is the operational practice of a government funded executive agency. i've seen ur poets on youtube so i hope u may design more of these clips that may help u in spreading this site. am sorry because am not good enough in english.